A LARGE GROUP of interested neighbors filled the Ebell Club to learn about, and comment upon, the project proposed for the two blocks adjoining Wilshire, between Rimpau and Muirfield. 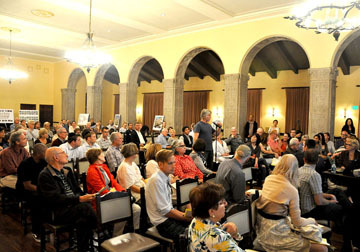 The ballroom at the Ebell Clubhouse set the scene for a community meeting on July 8 where revised plans were unveiled for a new residential development along Wilshire Blvd. between Rimpau and Muirfield. CIM Group—owners of the former Farmers Insurance property—presented its plans at the invitation of the Brookside and Hancock Park homeowners associations, with more than 100 residents in attendance. Clyde Wood, CIM vice president of development, provided attendees with a detailed overview of the project. Wood said his company made improvements to the design of the project following a January meeting with Brookside residents. Mile Specific Plan [PMSP] that controls this portion of Wilshire Blvd.) and the possible closure of one block of Mullen Ave., between Wilshire and Eighth St.
“The new plan basically responds to those two concerns,” said Wood. “No it wasn’t! Let’s state the fact, no it wasn’t!” The outburst was followed by applause from some in the audience. Wood responded to the outburst by saying that he would take the opportunity to better explain CIM’s motivation for closing the street. “The first thing it does is create one point of entry into the project. That means everyone will have to come from Wilshire, creating a sense of arrival. Wood explained that without vacating Mullen St., CIM would not have the flexibility under city planning procedures to shift a portion of the PMSP-allowed residential units from the block on the east side of Mullen to the existing tower that CIM plans to adaptively reuse as condominiums. Without this flexibility, however, CIM would not free up the space to build single-family-home-style units. Wood also discussed whether the community is interested in having a “pocket park” as part of the design, parking concerns and the scale of houses, as well as the process and timeline for the project. Architects Johannes Van Tilburg and Hans Anderle, together with city planner Scott Adams, gave presentations on their respective designs, noting how specific details used throughout were inspired by existing properties in and around Brookside. FORMER FARMERS TOWER at Rimpau and Wilshire is proposed by CIM Group to have 52 condominium units in its top five floors. Illustration above shows the view west from Muirfield Rd., with nine of the 24 units in three, three-story triplex buildings along Wilshire, at the right side of the drawing. South of those would be eight single-family houses, three-stories tall. South of those, along Eighth St., would be seven single-family houses, two-stories tall. Each of these 24 units will have its own two-car garages. The illustration also shows an existing single-family house on the south side of Eighth St. Following the official presentation by CIM, the floor was opened to members of the community with questions. Wieringa said she understands the project to be a condominium development with its own homeowner’s association. “Is that correct?” she asked. Wood explained the development holds a condominium designation partly because of the underlying zoning: The property is not zoned as single-family-residences (R1) like Brookside south of Eighth St., but instead is zoned as commercial and multi-family (CR and RD3). Owen Smith, Brookside’s president, who moderated the Q and A session, said that Wood and his colleagues and consultants had agreed to stay and discuss specific questions and issues with anyone who wished to stay. Many people did, with the last of the attendees leaving about 10 p.m.
Smith also said that there would be an organizing meeting of just Brookside residents the following week, and explained that the July 8 presentation is just one step of a very long process that began in January. The formal public review process will begin after CIM files an application with the planning department. Tags: Brookside, CIM Group, Hancock Park Homeowners' Assoc.